Thanks to Lorena, we now have a picture of the self-patterning yarn knit up! I really love how it came out. So much that I'm thinking that I'll have to do this again even though it was such a lot of work. At least I'll know what I'm up against this time. And I'll know enough to save a skein for myself!! In other news, Grandma's memorial service is tomorrow so I've been very busy cleaning and getting organized for that. My cousin Martha (actually my mother's first cousin) will be arriving here in the next hour or so and is spending the weekend. Consequently, there has been big house cleaning going on. I have actually been knitting as well. 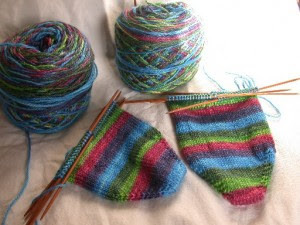 I have three socks on needles that I'm actively working on (we shall not speak of the ones that are just sitting around like so many knickknacks), a sweater for myself that is not quite up to the armholes and a sweater that I should be sewing up for a customer. There are times when I will sit down and sew up a sweater without even thinking about it and other times that the thought of sewing up makes crazy. I'm trying to get over the crazy and get this thing sewed up because I'm sure my nice customer would like her blankity-blank sweater to wear before spring. So, I guess I'll go be a good little shop owner and get that done. Have a nice weekend everyone! The striping on the socks look great. Hope we can get together to see Stephanie! I'm probably not able to get down there for the 22nd, but we're going to try to get her to come here again. I'll be talking to the bookstore about it this week! the socks are AWESOME. come see me the 22 if you can! I totally identify with the "sometimes I can do something with my eyes closed and sometimes it seems as though it will be really hard." Sometimes getting enough sleep helps, but it's not that simple.